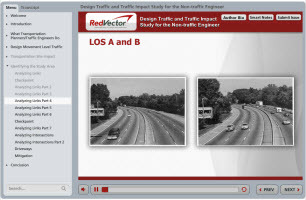 RedVector is excited to announce the launch of a brand new, mobile-ready eLearning course on Traffic Impact Studies for the Non-traffic Engineer! If you work with traffic engineers or transportation planners as part of a project team, then this course is for you! Learn what inputs the traffic professionals need to produce traffic studies, and what kinds of data they can provide on a project, all while learning how to coordinate projects more smoothly. This course will explain land use, access, and ‘build out year’ information that a traffic engineer needs in order to do a site impact study for a new development – and what the effects will be if that information changes during the study. It also explains how design traffic for roadway projects is developed, and how transportation projects are created, prioritized and scheduled as part of a Long Range Transportation Plan – LRTP. manage projects and teams that include a traffic component more efficiently and effectively; provide the proper inputs to the traffic professional – get them what they need to conduct traffic studies in a timely manner; identify the various types of information the transportation professional can provide, and the basics of how traffic studies are conducted; and recognize the implications that mid-stream changes in land use; project size; project phasing; driveway locations; and other factors have on a traffic study’s budget and schedule.